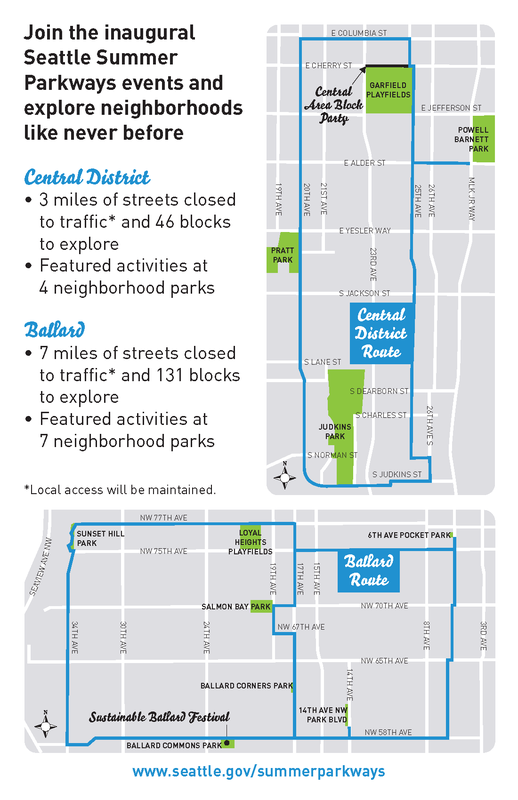 Summer Parkways is coming to the Central Area! Where can you bike, walk, dance, climb rocks, skateboard, see bike polo, listen to music, and so much more? Summer Parkways! Three miles of streets and the four parks they connect will come alive on Saturday, September 12. Be there! Summer Parkways kicks off with a grand opening celebration of the first section of the new Central Area Neighborhood Greenway, providing safe and comfortable streets for people biking and walking from S. Jackson to E. John. Join us at 11:00 a.m. at Garfield Community Center for the speechifying, ribbon-cutting, and celebratory bike parade. Summer Parkways festivities go from 11 a.m. to 3 p.m. Bike a bit, and then take in some music, bounce around on a harness trampoline, climb a rock, eat some food, and meet some folks from around the neighborhood, other parts of the city, or out of town. As you’d expect, it’s going to take a lot of volunteers to pull this off. If you’d like to help, go to http://www.cascade.org/summerparkways, and use Cascade Bike Club’s volunteer portal to find the right fit. 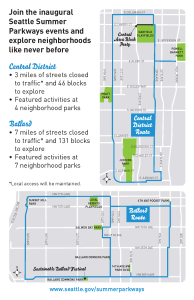 The following weekend, on September 19, the focus shifts to Ballard for another family-friendly fun-packed party in the streets.We’re modeling Summer Parkways after the incredibly successful Sunday Parkways events in Portland. Check out this video to see why we’re so excited.